In a civilian equivalent of a coup d’ etat, the Senate tuesday removed Senator Ali Ndume as leader replacing him with Senator Ahmad Lawan. Senate President Bukola Saraki announced the removal of Ndume shortly after the former leader, who had led the day’s proceedings, left the Senate chamber for his afternoon prayer at the National Assembly mosque. On his way out of the mosque, he was confronted with the news of his removal while plenary had also been adjourned to wednesday, January 11. A visibly shocked Ndume said it could not be true since he was not aware of any move to oust him. His removal was the last item handled by the Senate tuesday, an offshoot of a letter addressed by APC Caucus to the Senate president, informing him of a meeting it held on Monday, January 9 where it agreed to replace Ndume with Lawan as its new leader. 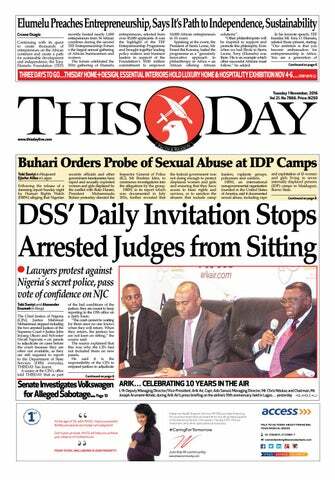 However, THISDAY checks revealed tuesday that Ndume was removed for two main reasons. First, he was accused of bringing the Senate into disrepute through series of behaviour and utterances, which senators considered as embarrassing to the institution. 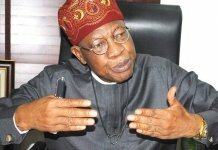 Prominent of such perceived embarrassing acts, which eventually consumed him was the interview he granted State House correspondents in the Presidential Villa on December 19, 2016 where he debunked Senate’s earlier official position, which had rejected the confirmation of Mr. Ibrahim Magu as the substantive Chairman of the Economic and Financial Commission (EFCC) on December 15 last year. Whereas the Senate had announced on December 15 that, in view of the damning security report against Magu, it had resolved in its closed-door session not to confirm Magu as the EFCC’s boss. According to Senate’s spokesman, Senator Sabi Abdullahi, the Senate had consequently rejected Magu and advised President Muhammadu Buhari to send another candidate as his replacement. However, while the news of Magu’s rejection was yet generating controversy in the polity, Ndume announced at the Presidential Villa that Magu had not been rejected. He emphasised that Magu could not be rejected in a closed-door session of the Senate where the decision was made. Ndume also dismissed Senate’s call for the resignation and prosecution of the Secretary to the Government of the Federation (SGF), Mr. Babachir David Lawal, over alleged mismanagement of internally displaced persons’ (IDPs) funds in the North-east. The Senate, therefore, considered a situation where its leader whom it felt was duty bound to protect the sanctity of its resolutions became the one allegedly twisting it as embarrassing. This prompted Abdullahi to brief the press the following day where he affirmed that Magu’s rejection was the Senate’s official position and there was no going back on it. Second, THISDAY also gathered yesterday that the Senate found Ndume’s removal this time to be appropriate in view of the recent rapprochement between the Senate leadership, the APC and the Presidency. Ndume had emerged against the wish of the party, which had in June last year, recommended the nomination of Lawan as Senate Leader following his loss to Saraki in the race to the Senate Presidency on June 9, 2016. But instead of abiding by the party’s decision, Saraki announced Ndume as the Senate Leader following his recommendation by the North-east caucus of APC to which the office had been zoned. Saraki said he could not alter the decision of his colleagues who had chosen Ndume for the office and rejected Lawan by 13 to 3 votes. The situation was seen by the party as an affront on it by Saraki whom it had accused of first emerging as Senate president against its wish and later failed to accede to its request to concede the Senate Leader’s office to Lawan. This generated bad blood among him, the Presidency and party leadership. Reacting to his removal yesterday, Ndume expressed shock over the development, saying there was no previous problem that could have warranted his ouster. He also said he was not aware of any meeting where the decision to remove him was taken, pointing out that there is usually a laid down procedure for the removal of a Senate leader, which he observed had not been complied with in this situation. “I went out of the chamber to pray at about quarter to 1pm. On my way coming, one of you accosted me that there was an announcement on change of leadership. I didn’t know what actually happened. I went to pray. When l came back, the Senate had adjourned and somebody told me that Ahmad Lawan had been announced as the leader of APC caucus. I don’t know what happened and what that meant. This morning, l still conducted the business of the Senate. I’m not aware of any meeting called. There is a process to follow. I will find out what that meant. Let me hear from the horse’s mouth,” Ndume said. But THISDAY further learnt tuesday that following the decision to remove Ndume, Deputy Senate President, Ike Ekweremadu and the Chief Whip, Olusola Adeyeye, were assigned to advise Ndume to resign ahead of the announcement but at the time they wanted to tell him, he was nowhere to be found. A source told THISDAY that he seemed to have had a hint of the decision to remove him and consequently left the chamber to forestall it. The source added that when he was nowhere to be found, there was the insistence by senators that the letter of his removal must be read yesterday whether he was there or not. The source further told THISDAY that the fact that there was no dissenting voice to his removal was a clear expression that every senator was done with Ndume. The All Progressive Congress (APC) yesterday endorsed the removal of Senator Ali Ndume as the Senate Leader, saying it was a welcome development. ‘’We welcome the development in the Senate, which led to the replacement of the former Senate Leader, Senator Ali Ndume with Senator Ahmed Lawan, both members of our great party, the All Progressive Congress (APC)’’, the party stated in a statement signed by its National Publicity Secretary, Mallam Bolaji Abdullahi. The ruling party said: ‘’It should be recalled that soon after the issue of election of the Senate occurred, the party leadership had resolved that Senator Lawan be compensated with the position of the Senate Leader. APC thanked Ndume for his service and sacrifice to the party that would not be forgotten, and congratulated Lawan, the new Senate Leader on his election by the APC caucus in the Senate, hoping he would use his vast experience and knowledge to enhance legislative works to further the party’s agenda of change. 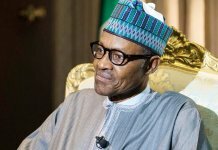 The party assured Nigerians that it would continue to work assiduously under the leadership and guidance of President Muhammadu Buhari to resolve any other pending issues that might have affected the party at different levels. The party added that with this latest development, APC had demonstrated its resilience and capacity to resolve its internal differences in order to realise the true change and transformation that it promised Nigerians. Earlier in the day, Saraki harped on the preponderance of policy inconsistencies by the federal government as the bane of economic prosperity in Nigeria. “The issue of policy inconsistencies remains an issue that continues to challenge our business environment. I have in the past argued and still hold the view that for a private sector-led economy to thrive, we need to reform our policy environment to give investors and our businessmen and women ample adjustment time to make informed investment decisions rather than have uncertainties,” he said. The Senate president said 11 economic bills currently being considered in the Senate would create 7.5million jobs and reduce poverty by 16.4 per cent when they are passed into law. He, therefore, urged the relevant committees to fast-rack the process of passing the bills to facilitate their subsequent transmission to the executive along with the 2017 budget. Saraki also said the 2017 – 2019 Medium Term Expenditure Framework and Fiscal Strategy Paper (MTEF/FSP) would be debated and passed this week while the consideration of the 2017 Appropriation Bill will characterise Senate’s “three sitting days” next week. He also urged all heads of Ministries, Departments and Agencies (MDAs) to ensure timely submission of their annual budgets within the current budget cycle or risk waiting for the next fiscal cycle if they fail. Saraki also condemned the mindless killings in Southern Kaduna, promising that the Senate would carry out a thorough investigation into the matter and advise the executive appropriately. The Senate president said: “While we have our attention on the economy and are working with sweat on our brows to improve it for the betterment of our people, we cannot lose sight of the callous and growing circle of violence across the country, especially now in Southern Kaduna. He also reiterated the importance of the 2017 budget to the planned exit of economic recession and urged his colleagues to double up efforts to get the budget to the executive for implementation within the shortest possible time. He emphasised the need for the National Assembly to pursue and conclude the ongoing constitutional review process by the end of March, adding that the Senate would henceforth not spare any organisation which tramples on the rights of consumers in the country by paying keen attention to the protection and preservation of consumers’ rights. “The current situation where consumers’ rights are violated and treated with indignity must stop,” he said. Saraki appealed to the executive to commence an open and meaningful dialogue with Niger Delta militants in order to stabilise the petroleum industry. He also advised it to take advantage of rising crude oil prices in the international market to turn around the fortunes of the nation’s economy. The Senate yesterday also condemned the protracted and mindless killings in Southern part of Kaduna State by suspected Fulani herdsmen and consequently resolved to constitute an ad-hoc committee to probe the immediate and remote causes of the tragedy. The upper chamber also rejected the federal government’s move to close the Nnamdi Azikiwe International Airport for six weeks and consequently summoned the Minister of State for Aviation, Hadi Sirika and his counterpart in Power, Works and Housing, Babatunde Fashola, to appear before its Committee on Aviation to explain the rationale behind the decision. The Senate also rejected the appointment of Professor Akintunde Akinwande as the Chairman of National Electricity Regulatory Commission (NERC) but confirmed six other nominees as members of the commission. Moving a motion on the killings of innocent Nigerians in Southern Kaduna yesterday, Senator Danjuma La’ah (Kaduna South), recalled how various communities in the area had been consistently attacked by suspected herdsmen, resulting in several deaths, injuries, loss of properties and displacement of the communities. He listed communities persistently attacked since December 23, 2016 by the suspected herdsmen to include Ambam, Gaska, Dangoma, Tsonje, Pasankori, Gidan Waya and Farin Gada of Iama’a and Kaura Local Government Area. He said: “The killings of citizens of Southern Kaduna amount to serious violations of the right to life, right to security of human persons, right to the respect of the dignity inherent in human being and right to property not only guaranteed by the 1999 Constitution as Amended, but also of the African Charter on Human and People’s Rights and the international convention on Civil and Political Right which Nigeria is a party. 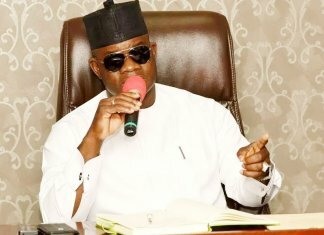 “A total number of eight hundred and eight (808) persons were killed in 53 villages across the four Local Government Areas in the affected areas, while 57 persons were injured, farm produces estimated at N5.5billion were destroyed and a total of 1, 422 houses and 16 churches were burnt during the attacks. 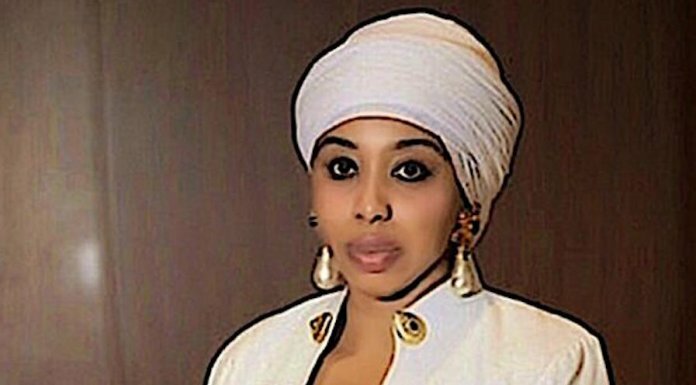 “In the last one year, we have witnessed a harvest of killings by these marauding herdsmen with several cases of massacre in Agatu in Benue State, Uzo Uwani in Enugu State, with several attacks in Taraba, Delta and Edo States to mention but a few,”La’ah said. However, Deputy Senate President, Senator Ike Ekweremadu, advised his colleagues against debating the motion to avoid the bad blood it might generate in the polity. Hence, the parliament agreed to probe the immediate and remote causes of the menace. Also yesterday, the Senate opposed the planned closure of the Nnamdi Azikiwe International Airport Abuja by the Federal Airports Authority of Nigeria (FAAN) for six weeks, beginning from March 6, 2017. Consequently, it ordered its Committee on Aviation to summon Sirika, Fashola, Federal Capital Territory (FCT), Mohammed Bello, Chief of Air Staff, Air Marshal Sadiq Abubakar and heads of aviation agencies within two days with a view to persuading them to come up with an alternative solution. 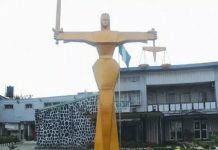 This decision was the fallout of a motion by Senator Hope Uzodinma (Imo West), who had argued that six weeks outright closure of the only airport in the nation’s capital would trigger untoward hardship for both international and local air travelers. He also said the development would attract negative perception of the nation’s image. He added that a complete shut-down of the airport would impact negatively on international trade and related activities with a multiplier effect on an already recessed national economy. In his remark, Saraki described the move as bizarre, as he sought to know where such an episode had happened in any part of the world. “Where else in the world are things done this way? The idea of total closure of the Abuja Airport is not the best option. Therefore the Senate Aviation Committee should meet with the relevant ministers and heads of aviation agencies within the next two days to seek for an alternative option and report back to the Senate within a week for final decision over the matter,” he said. The Senate also approved the recommendation of its Committee on Power, Steel Development and Metallurgy for the rejection of the nomination of Akinwande as NERC’s chairman over his failure to appear before the committee for screening twice as scheduled. The Committee Chairman, Senator Enyinnaya Abaribe, while presenting the report, advised President Muhammadu Buhari to send the name of another nominee to the Senate for confirmation. The Senate however, confirmed the nominations of six others whose names were sent to it along with that of Akinwande. The nominees so confirmed were Sanusi Garba (Vice Chairman, North-west); Nathan Rogers Shatti (North-east); Dr. Moses Arigu (North-central); Dafe Akpedeye (South-south); Prof. Frank Okafor (South-east) and Dr. Musiliu Oseni (South-west).